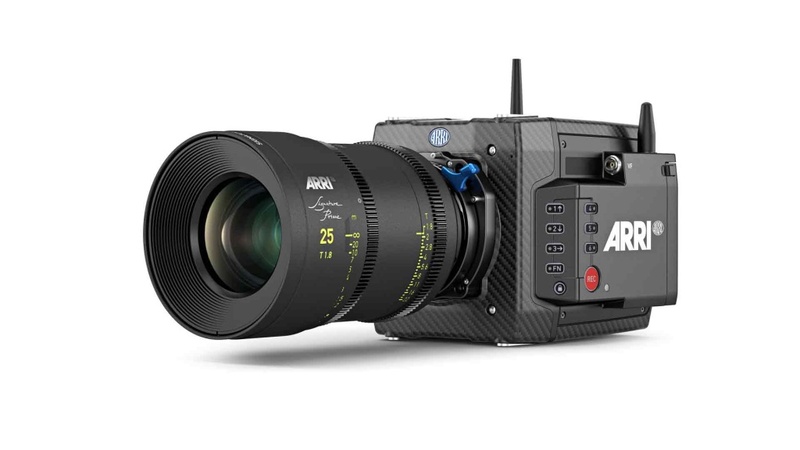 Arri announced the Alexa Mini LF, a scaled-down version of the large-format Alexa LF camera in a form factor better suited to shooting in tight spaces, on drones or specialized rigs, or anywhere else where smaller is better. Like the standard Alexa Mini, the Alexa Mini LF is built around the same 4.5K 36.70mm x 25.54mm sensor as its larger sibling, but the camera body has been streamlined to reduce size and heft. In fact, Arri says the Alexa Mini LF is the same size as the Alexa Mini, except for a new “media bay” on the left side of the camera. (More on that below.) The Mini LF has extra connectors compared to the Mini, including 12 V and 24 V accessory power outputs, a six-pin audio connector and two built-in microphones. The operating side of the camera has six user buttons, and three internal, motorized FSND filters (0.6, 1.2 and 1.8) are built in. Still in the prototype stage but scheduled to ship in the coming months, the camera weighs 5.7 lbs. (2.6 kg) with Arri’s LPL lens mount. The new MVF-2 OLED HD EVF, with its four-inch flip-out monitor, adds 1.7 lbs. (800 g). The MVF-2 can be connected via CoaXPress VF cable for remote operation at up to 10m, Arri said. The Mini LF won’t have exactly the same capabilities as the Alexa LF. With the smaller form factor come some compromises in circuitry. For example, while the Alexa LF can reach a maximum frame rate of 150fps in 2.39:1 4.5K mode, the Alexa Mini LF tops out at 60fps in the same recording mode. For onboard recording, the Mini LF uses a new media type, the 1 TB Codex Compact Drive SSD, for recording MXF Arriraw and MXF Apple ProRes. The drive can write to media at up to 8 Gb/sec, and both recording formats can be written to the same SSD without reformatting or switching drives. Arri also said a new “high-density encoding” (HDE) option from Codex can losslessly compress Arriraw files by “around 40%” on download or later in the post-production process. It sounds complex, but Arri said a new MacBook Pro should be able to encode Arriraw Open Gate 4.5K footage at 24 fps. No extra licenses or fees will be required to use HDE with Codex Capture or Compact Drives, Arri said. Users may not be excited about the appearance of a completely new media type, but Arri said the new Codex drive will also be used with future cameras. A standalone, USB-C-connected Codex Compact Drive Reader will be released, as well as an adapter that allows the Compact Drive to be used in Codex SXR Capture Drive Docks. That LPL lens mount gives the Mini LF the ability to take the same array of lens types as the larger LF model, including Arri’s own large-format lenses as well as glass from Angenieux, Leitz, P+S Technik, with more to come from Zeiss, Sigma, Tokina, and Cooke. Other options include Panavision’s PV/PV70 mount (for large-format Panavision lenses), and Vantage’s XPL52 mount (for Vantage lenses), and a PL-to-LPL adapter for PL lenses. The LPL mount passes LDS-2 and /i metadata, and the PL-to-LPL adapter passes LDS-1 and /i metadata. To promote the new camera, Alexa made a short film depicting the camera being used on a shoot. Watch it below.